Now that the iPad is finally official, any publisher that wasn’t already figuring out how to bring their content to a color, touchscreen device is probably scrambling to do it now. That’s a bit easier said than done though — while it probably wouldn’t be too tough to simply scan in text and present it in a static format, converting it into something that actually takes advantage of the new platform is going to prove difficult. That challenge is giving rise to some new startups looking to help publishers make the transition from paper to digital. One such company is called Inkling, a small startup that’s raised $1 million in seed money from Ram Shriram, Mitch Kapor, Aydin Senkut, and other angel investors. Inkling is looking to help textbook makers convert their content into digitized versions that are more than just static reproductions of the original text. In other words, they’re helping spur the kind of innovation that could change the way we learn (but could take publishers a long time to figure out if they’re left to their own devices). So what exactly can the platform add beyond the text these publishers already have? CEO Matt MacInnis says that Inkling is building tools that give publishers a scalable way to add interactive and dynamic content. They’ll be able to include interactive figures and quizzes. And they’ll be able to give their texts cloud connectivity, allowing students to download new, updated content. Other benefits from connecting to the cloud include the ability to sync your work between multiple devices, and the ability to add social features to a text. Imagine if you had a question about a particular diagram in your text; you could send it to your professor, and they could leave an annotation in the book that would be visible to all other students. Inkling is currently in talks with all four of the major textbook companies, though MacInnis wouldn’t divulge whether they’d signed any deals yet. He does say that the company is also interested in working with smaller publishers, including free projects like California’s free textbook initiative. 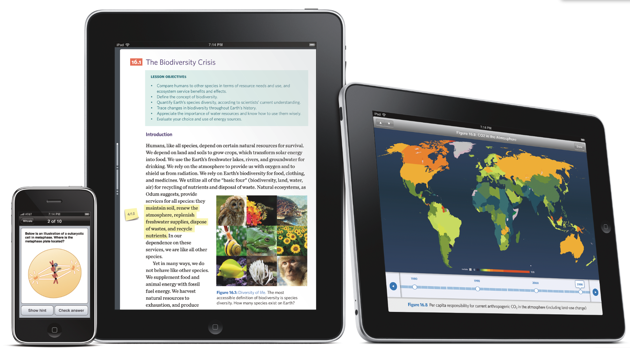 But Inking isn’t the only startup looking to help publishers take advantage of the iPad. 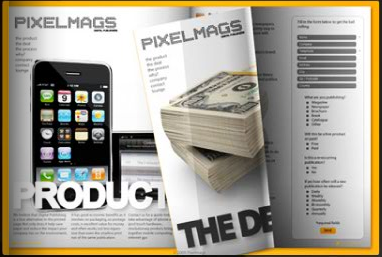 Another player is PixelMags, which is looking to help magazine publishers make the leap themselves. PixelMags has actually been around for a while, offering to help magazines get their content on the App Store for consumption on the iPhone. As of today, they’re making the jump to the bigger screen. They company says that it will allow publishers to include both text and streaming media in their magazines, and they’ll take care of getting the content into the App Store. It’s great to see companies that are looking to help publishers truly take advantage of the iPad, but I am concerned that Apple may soon step on their toes. During its event today, Apple showed off its native eBook reader, but it wasn’t clear if it would be offering a similar universal reader for magazines or textbooks. I suspect they will, otherwise each magazine and book could have an inconsistent user interface. And that means companies like Inkling will have to adjust their content to work within whatever file formats Apple allows for.